Like spring time to summer, The Pikes Peak Celtic Festival blossomed from an old tradition in Colorado Springs. 1999 marked the last year of the Pikes Peak Highland Games. 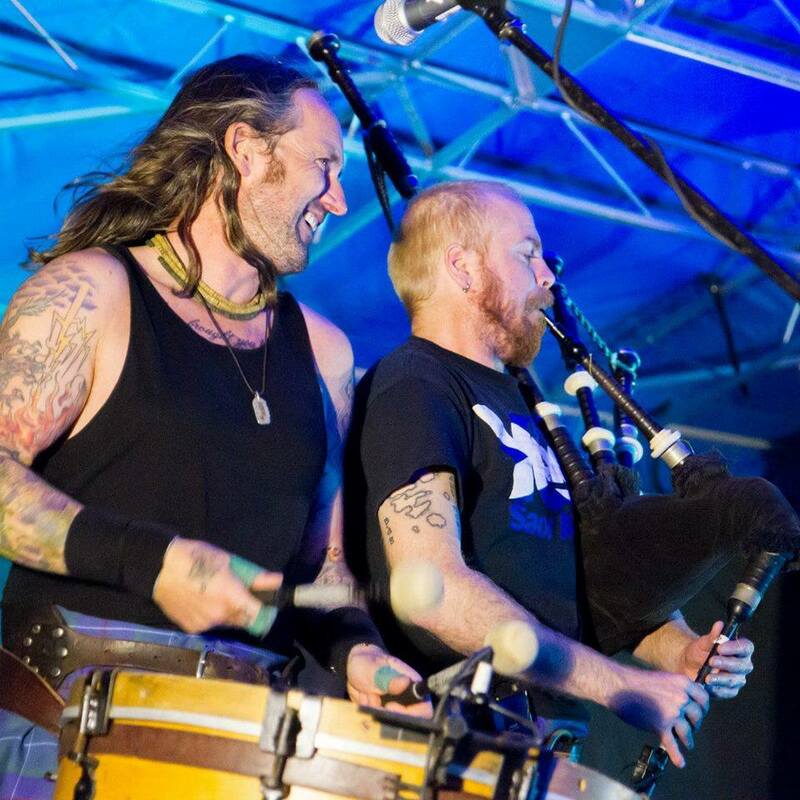 In 2013, the festival was brought back with new vigor under the new name-Pikes Peak Celtic Festival. The Festival field at Memorial Park will be filled with the sound of Bagpipes, the smell of fish & chips, the sight of world champion Irish dancers, and events/activities for every age. See the very best of the Rocky Mountain Scottish Athletes, or even try your hand at competing yourself! Be inspired by the massed bagpipe bands of the Western United States Pipe Band Association march in unison. Enjoy world renowned Celtic Rock band Albannach along with Delilah’s Revenge, Big Paddy, Rare Ould Times, Skean Dubh, The McDeviants, RenScots , Celtic Steps, Rocky Mountain Highland Dancers, Western US Pipe Band Association, See and learn tradition Irish and Highland dancing. When you need a break from all of the entertainment, visit the Celtic artesian and gift vendors, learn at cultural exhibits, stop and taste the best in Irish and Scottish cuisine, or get a Celtic cooking demonstration from Chef/Author Eric McBride/The Celtic Caterer who will have his autographed recipe books on hand. 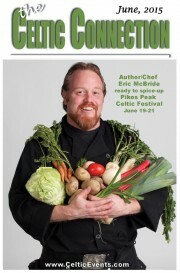 The Pikes Peak Celtic Festival runs June 19-21. Hours are: Friday 4:00 PM -10:00 PM, Saturday 9:00AM- 5:00 PM, Sunday 9:00 AM -4:00 PM. Ceilidh at Jack Quinn’s 6:00 pm Saturday June 20. CELTIC WOMAN – 10th Anniversary World Tour! Global music sensation, Celtic Woman, return to Red Rocks Amphitheatre with their 10th Anniversary Celebration Tour. The enchanting musical experience features Celtic Woman performing a treasure chest of traditional Irish standards, classical favorites and contemporary pop songs, with an unforgettable signature style. The 10th Anniversary Celebration Tour features four sublimely gifted Irish women – three angelic vocalists and dazzling Celtic violinist – along with a full band, The Anotas Choir, bagpipers, Irish dancers with bewitching choreography – all under the direction of Emmy®-nominated music producer David Downes. This is a true celebration of their incredible 10-year journey that has captivated millions. Tickets are $110.00, $65.00 & $40.00 RES and $25.00 GA plus applicable service charges. Tickets Available at www.LIVENATION.com, the Fillmore Auditorium Box Office, all Ticketmaster outlets or by phone at 800-745-3000. Tickets to this show are not available at the Denver Coliseum box office. Chancer’s Hooley plays at the Capitol Hill People’s Fair in Denver’s Civic Center Park on the 7th at 5:15 PM and on the 8th at the Platte River Saloon from 7 – 9 PM. 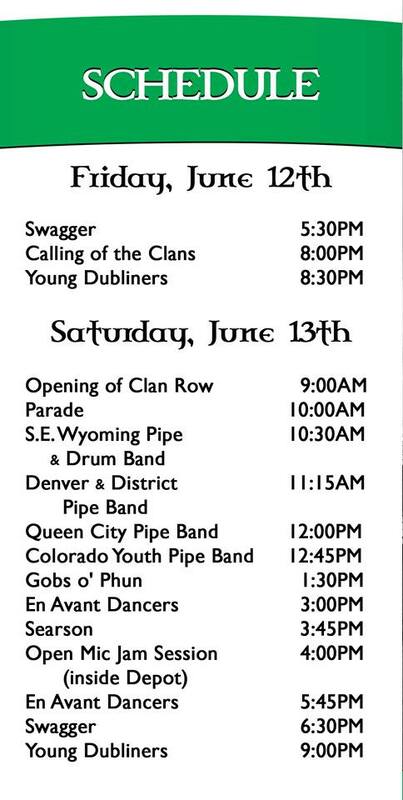 Gobs O’Phun is on the Cheyenne Celtic Festival on the 13th. Colcannon performs with The Evergreen Chorale on the 5th and 6th at 7:30 PM and the 7th at 3 PM at the Center Stage, 27608 Fireweed Drive in Evergreen. Westminster Brewing Company at 7 PM. 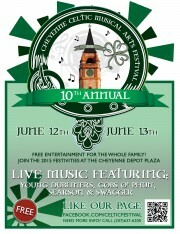 You can catch Keep Britain Irish at 7 PM on the 6th at Maddies Biergarten, 330 Third St in Castle Rock. Avourneen does its usual show at 9 PM on the 5th, 12th, 19th and 26th at Katie Mullen’s and is at the Abbey Tavern on the 27th. Adam Agee and Jon Sousa play with Take Down the Door on the 11th at 6:30 PM for the Lyons Sandstone Park concert series, on the 12th in The Pullman Room, downstairs at the Henry Strater Theater in Durango at 7 PM – Admission $15 and at The The Hotel Telluride on the 14th from 6:30 – 9 PM. The Stubby Shillelaghs are at the Big Beaver Brewery in Loveland on the 6th, play for the grand opening of Dungeons and Drafts in Ft. Collins on the 12th, the Pikes Peak Brewery in Monument on the 13th and will play no shows the rest of the month (other than their regular Tuesday night gigs at Patrick’s in Greeley on the 2nd, 9th and 30th) as lead singer Andy is getting married on the 18th. The reliable and legendary Brian Clancy is at Jack Quinn’s in Downtown Colorado Springs, on the 4th, 11th 18th and 25th at 7:30 PM and The Irish Snug on Capitol Hill in Denver on the 6th, 13th, 20th and 27th at 8:30 PM. The Indulgers stick close to home in June with appearances at The People’s Fair in Denver on the 6th 5:25 PM, the Erie Village Summer Concert series at 7 PM on the 19th, Conor O’Neill’s in Boulder at 10 PM on the 20th then end the month on the road at Groovefest in Cedar City, Utah at 9 PM on the 26th. Potcheen opens June on the stage of the Whitewater Bar and Grill in Canon City at 8 PM on the 6th, then performs on the Main Stage at Denver’s People’s Fair on the 7th at 3:15 PM, performs at the Apogaea Art and Music Festival in Bailey at 7 PM on the 12th, the Millsite Inn in Ward at 1 PM on the 13th, 10 PM at the Pioneer Inn in Nederland on the 13th, Muddy Bucks in Evergreen at 6 PM on the 19th, Cactus Jack’s Saloon in Evergreen at 2 PM on the 20th, My Brother’s Place in Pueblo on the 26th at 10 PM, Centennial Park in Canon City at 6 PM on the 27th and end the month in Rye at Bishop’s Castle on the 28th, time tbd. The 2015 Pikes Peak Celtic Festival happens this year from the 19th to the 21st at Memorial Park in Colorado Springs. Featured bands include Albannach, Big Paddy, Ceol Ceili, The McDeviants, Skean Dubh, Rare Ould Times and Delilah’s Revenge. There will be Irish Step dancing by the Celtic Steps and Scottish Highland dancing from the Rocky Mountain Highland Dancers, heavy Scottish Athletics, WUSPBA Pipe Band competition, RenScots, The Celtic Caterer, kid’s attractions, fun, food, merchants, vendors and whisky tasting as part of the festivities. Festival info and ticket prices at http://pikespeakcelticfestival.com/festival-info/ .